Behind the Glow | WTH Is CBD And Should I Be Into It? By now, you’ve probably heard all the buzz surrounding CBD in the wellness community. It seems that everyone is using it in some way and touting all of its benefits. I connected with the brand CBD Essentials to try out a few of their products featuring this magical oil and understand why everyone has been singing its praises. But let’s back up - what is CBD anyway? And doesn’t it make you high?! CBD stands for Cannabidiol and it’s a compound from the cannabis plant that *is not* psychoactive. Meaning, it doesn’t alter your brain function/make you high. What it does do, is work with our body’s Endocannabinoid System which has receptors all over to connect our body and mind and keep us functioning well. This system helps to regulate things like stress and gut health. Specifically, CBD can act as an agent to ease inflammation, anxiety, nausea and more. With all of its benefits, it’s no wonder CBD has been catching the eye of wellness brands (although its use is really nothing new). And some, like CBD Essentials, were founded completely around this versatile ingredient. CBD Essentials Lip Balm:: Simple and super effective. The ingredients here are just organic coconut oil, beeswax, shea butter, premium CBD oil and essential oils. I got the coconut one and love it. It moisturizes my lips and has some pretty impressive staying power. If I apply it at night, drink some water, give my husband a kiss and sleep through the night, it hasn’t rubbed off in the morning. Kinda miraculous. And while my lips don’t have any serious dryness issues, I can imagine the anti-inflammatory property of CBD would really alleviate this for someone who does. Post-Workout Soreness: After some particularly grueling leg days, I slathered some of the cream on my thighs and booty. The first time, I honestly didn’t feel much relief, but my skin was incredibly soft. The next time I was much more generous with the amount used and then felt a decrease in soreness pretty quickly. Period Cramps: I had high (haha) hopes for this one, but again I think I needed to use more product. I’ll try again next month. Joint Pain: Again, my workouts can be intense and my elbows and knees require a little extra love. This cream did a surprisingly good job of taking down the pain and the effect lasted hours. Tense Muscles: I carry a ton of tension in my neck but after massaging some of this cream in, I felt so much better. This would be good to carry when you travel and sleep wrong on a plane or road trip. Sore Feet: I read that Mandy Moore used CBD oil to keep her feet happy, so obvi I had to try it. I strategically wore one of my most uncomfortable heels this past Saturday to church. Before putting them on, I loaded up my feet with the cream and massaged it in. It absorbs within a minute, so I was able to slip right into my heels and didn’t feel like I was sliding around at all. A few hours later, my feet were still feeling good. And you know that feeling of pain when you take off heels and start walking barefoot and your poor feet freak out from the change? Didn’t happen this time. I know feet are particularly sensitive for absorbing oils so this might be why it worked so well. Whether that’s the reason or not, I totally recommend this life hack. So there you have it. I’m a new convert to CBD topicals. Will it work for you? Honestly, every person’s body is different and you may have to use less or more depending on how you react. 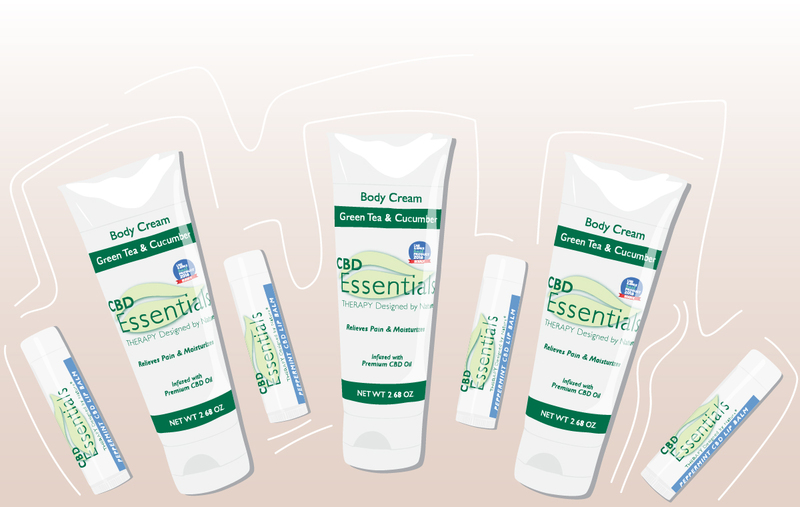 But if you’re looking to dive into CBD, I recommend checking out CBD Essentials. They also carry a massage oil and a salt soak (which I’ll be posting about soon!). Do you use CBD products? What are your thoughts? I love hearing about new products, so spill below!